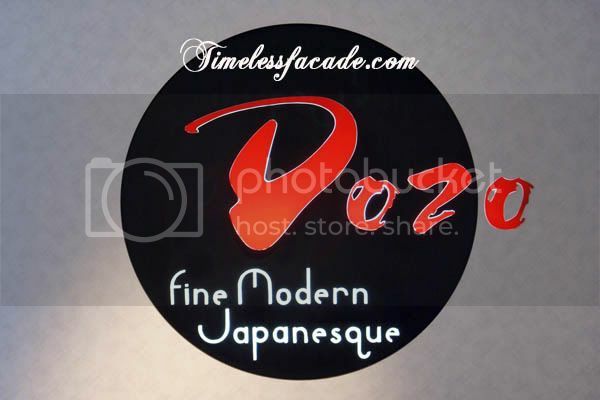 Dozo - the upscale sibling of Tao's Restaurant that dabbles in fine modern Japanese cuisine. 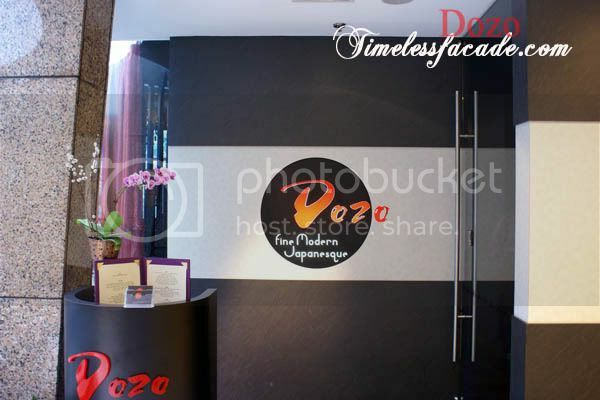 Dozo, which means please in Japanese, operates very much like its little sister, offering only 6 or 7 course set menus with no ala carte option. 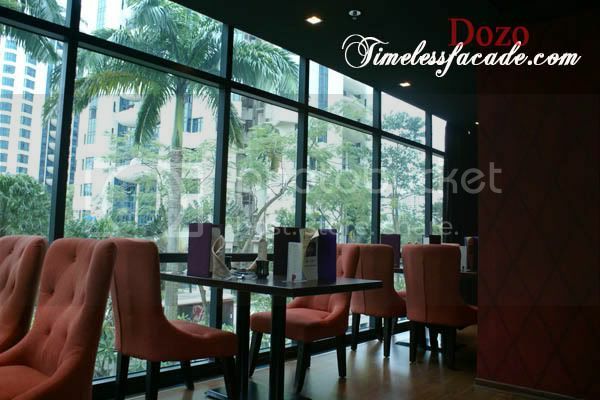 Located on the 2nd level of Valley Point along River Valley Road, Dozo's interior oozes sublime chic and sophistication with mainly red velvety plush chairs amidst a black backdrop. Floor to ceilings windows offer a somewhat muted view of the surroundings. Apparently the 3 window side seats on the elevated wooden platform is a hot favourite amongst couples so be sure to make your reservations early. The flour sticks were, well, flour sticks dusted with chilli flakes and the likes. Nothing too fancy here. As for the 2 shots of mango juice with tons of crushed ice, lets just say I had a hard time trying to get a reasonable amount of liquid into my mouth initially. You don't get to choose the first course and everyone gets the same thing - scallop, foie gras and smoked salmon, which wasn't too bad really. 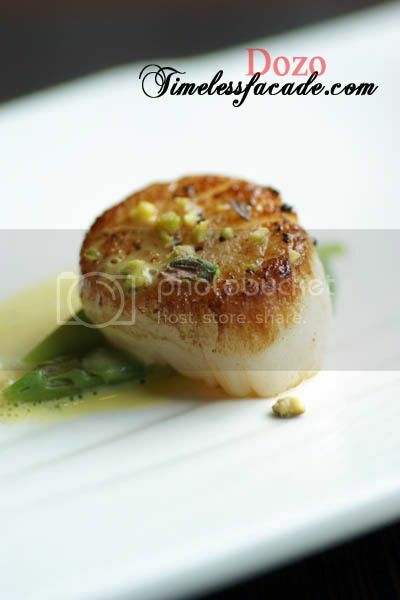 The scallop was nicely seared with a crisp layer atop but lacked the firm texture that I was looking for. 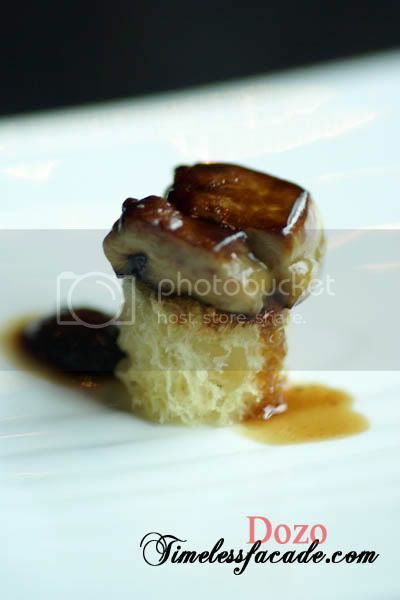 Apart from the foie gras being really small, I thought it was decent but could have been more quivery. 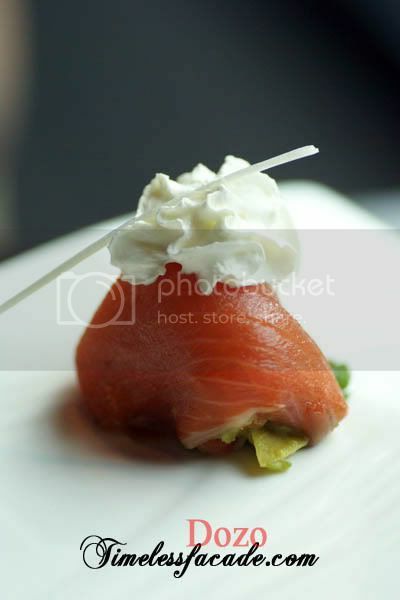 I thought that the smoked salmon was quite well done though. Not mind blowingly salty with a nice taut texture sans the raw fishy aftertaste. 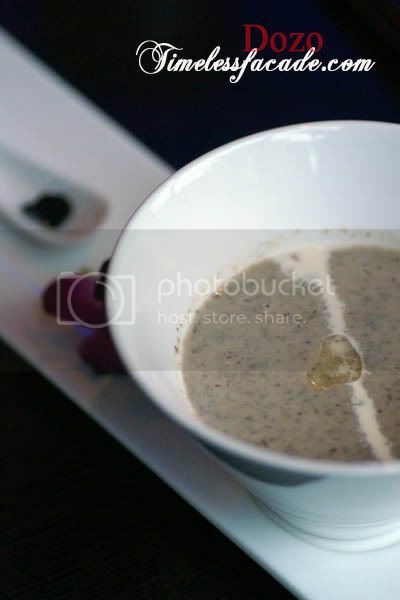 The mushroom soup had bits of mushroom in it and 1 lone black truffle served on a little flat tea spoon by the side, which you can choose to plonk it into the soup or nibble on it individually. I chose the former, which didn't seem to make much of a difference to the soup. Overall still quite decent though but a tad too watery for my liking. 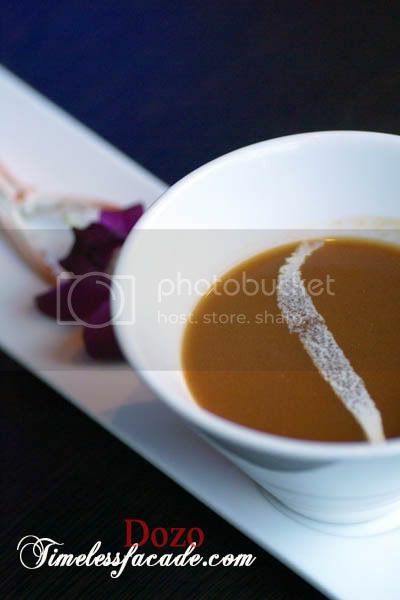 I thought that the crab bisque was rather watered down as well and tasted rather limp even though there were signs of crab meat in the soup. 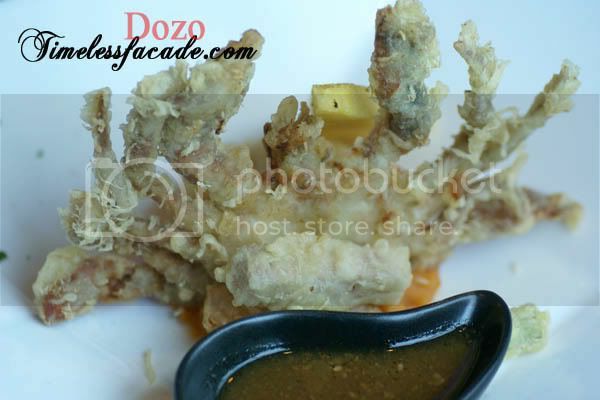 The tempura batter was decently thin but lacked any flavour, which made it really bland. 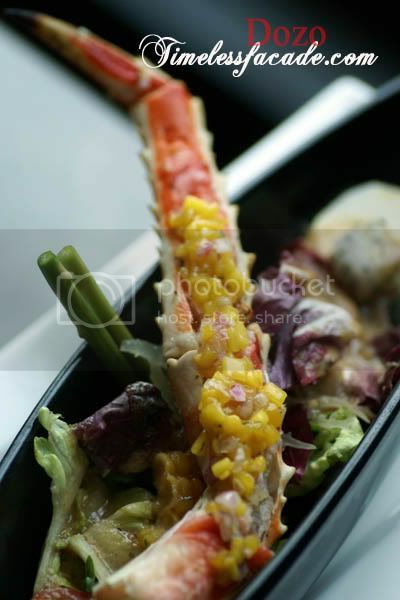 On the upside, the crab wasn't too oily and the sesame vinaigrette alongside helped alot in ensuring its palatability. 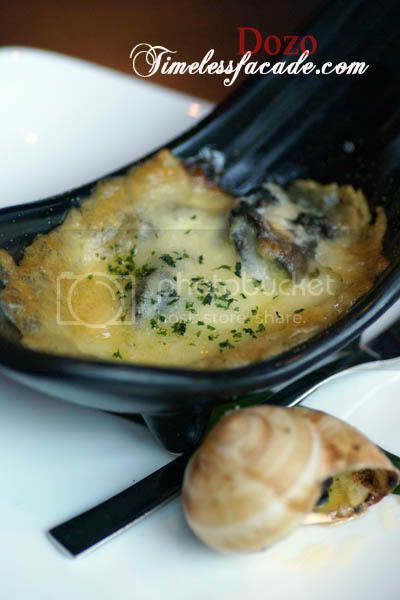 A group of 3 escargots came with cheese and Yuzu butter while a solitary one was presented with garlic. Personally I preferred the ones in the cheese as it came across as creamy with a slight chewy texture. The garlic one needed a stronger dose of garlic in my humble opinion. 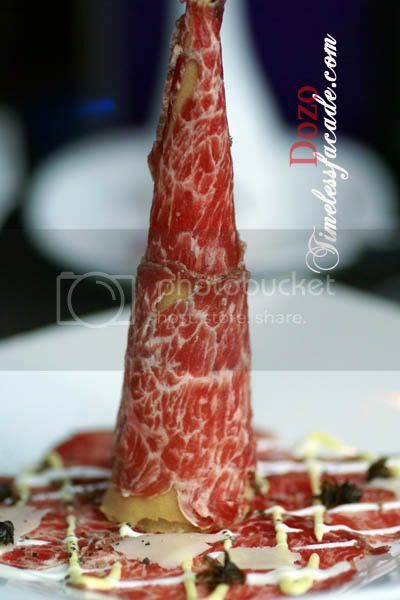 The beef tataki certainly didn't do itself any favours with its dryness but interestingly, a few slices of the beef were wrapped around a crispy flour cylindrical cone which was something different, especially with the truffle mayo. But I can't say that I enjoyed it very much as the beef was bland and relied on the mayo to give it flavour. Freshly succulent, the crab meat (purportedly from Alaska) was complemented by chopped onions and sweet mango, which made it sweet and "oniony" (for lack of a better word) at the same time. With such a delightful centrepiece, who needs vegetables? 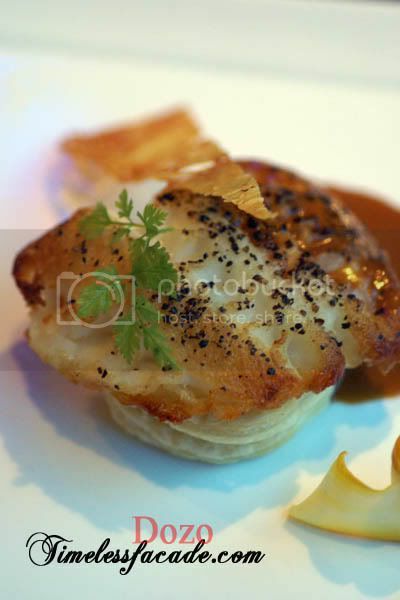 This dish is interesting in the sense that the cod fillet is literally stuck onto the puff pastry, which can be a pain if you don't wish to have the pastry, especially when its rather tough and unyielding to begin with. However, I've got to give the fish credit for being fresh and firm with a nice crispy layer of skin to boot. 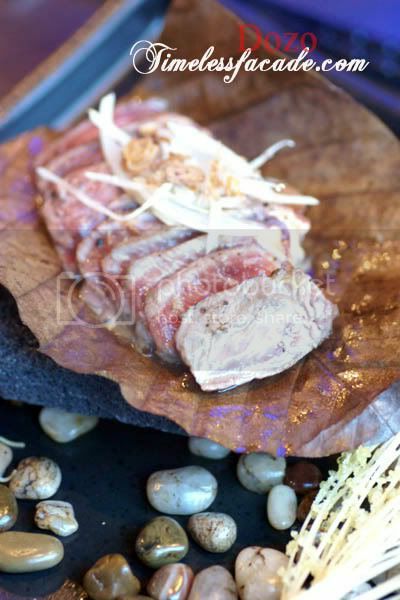 To be honest, I am unable to make an accurate judgment on the beef as by the time I was done taking my lousy shots, the 200 degrees celsius slab of granite stone had already cooled considerably and the beef just wasn't sizzling anymore. Maybe due to that, the beef slices turned out soft but still juicy and rather tasteless. A shame really, especially with the excellent asthetics. 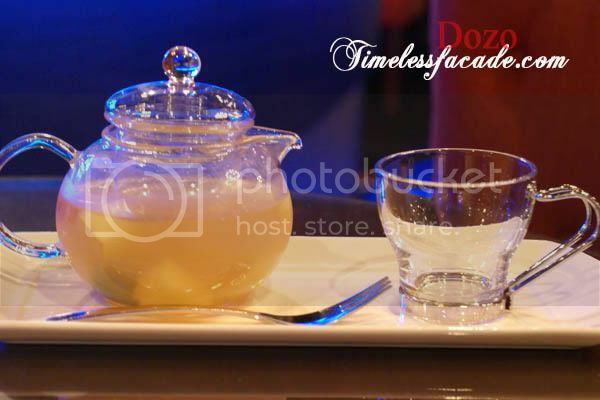 You get a choice from a couple of hot or cold teas and its a nice refreshing change from the usual palate cleansers or drinks. Puny would probably be one of the adjectives to describe the chocolate cake. 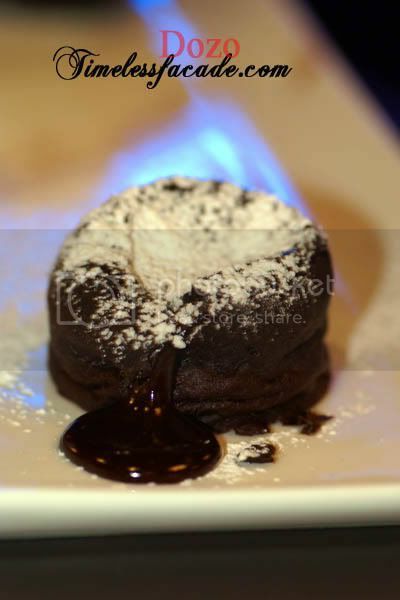 The crust was nice but a tad thick while the molten chocolate was of the runny kind. Decent but not really outstanding. 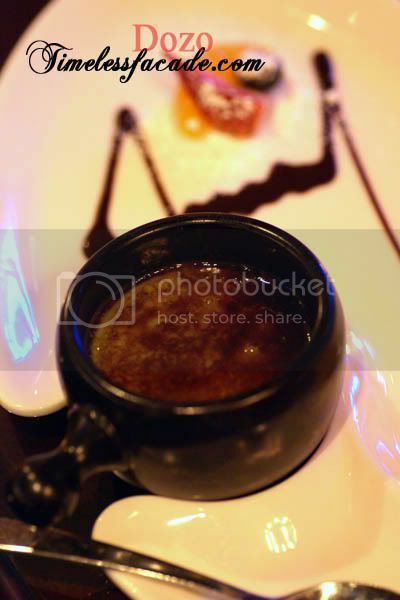 The sugar layer on the creme brulee was a tad too burnt but I appreciated the rather evident green tea taste of the creme brulee. A welcome change from the usual vanilla ones. 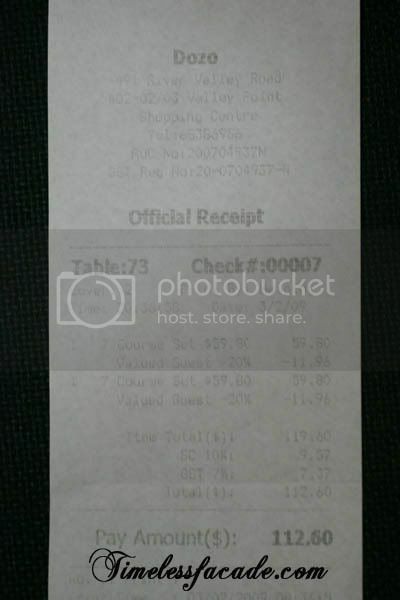 Dinner cost $59.80++/pax ($70.40 after taxes), which did come across as a tad steep even though service and ambience were top notch. 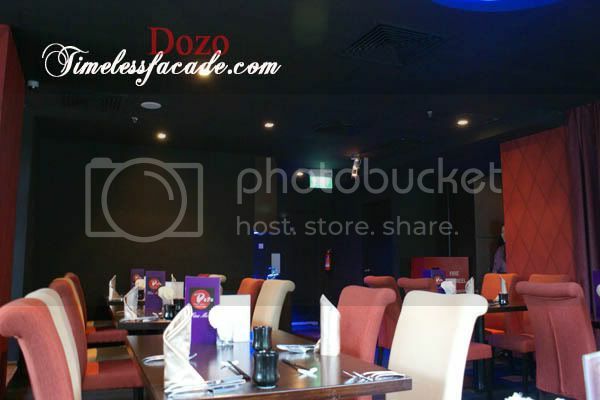 Food quality wise, there is still ample room for improvement in my humble opinion and if Dozo can work on this, I'm sure it will be a hit. The food really look mouth watering, too bad only score 6.5 on your score sheet. 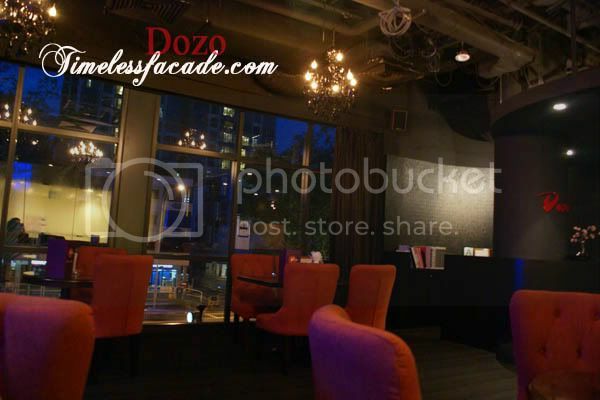 to me, dozo seems to be a place to go to at least once. but personally i will not recommend to return. i think u have rightly pointed out that some of the food are not outstanding but indeed the overall presentation deserves commendation due to artistry effects and attention to details. kenn: Yea the taste isn't great. rata: Yes you are right! 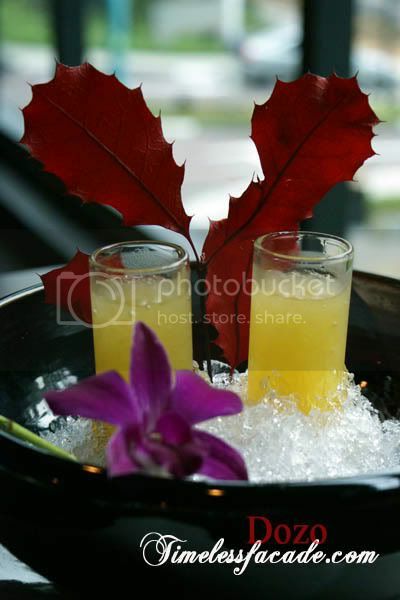 Its a one off thing unless ambience and service is a priority over taste of food. LIC: yea they are by the same founder. Have heard so much about them. 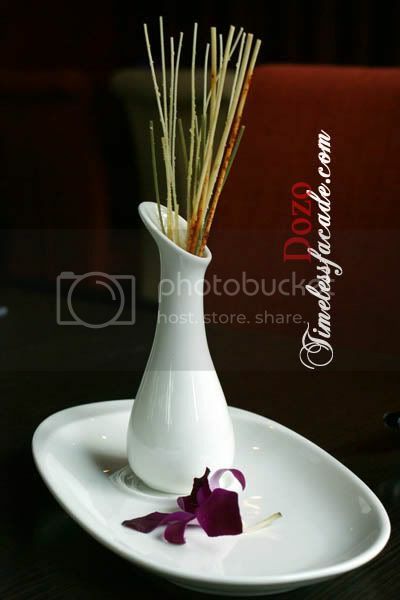 But interestingly, I realised there isn't any carbo or carbo dish for a Japanese restaurant.